February 05, 2018 - "New Product Release"
The Ross line of VersaMix Multi-Shaft Mixers are ideal for processing medium to high-viscosity applications up to several hundred thousand centipoise including many slurries, pastes, gels and suspensions. Pictured is a 500-gallon VersaMix (Model VMC-500) equipped with a custom combination of independently-driven agitators. The anchor agitator with helical flights and the screw auger agitator work in tandem to promote efficient product turnover while bringing air pockets to the surface; two saw-tooth high speed disperser blades impart shear for fast powder wet-out and thorough deagglomeration. This VMC-500 also features special air casters for convenient mobility of the mix vessel, PLC recipe controls with data acquisition capabilities as well as a purged explosion-proof operator station. 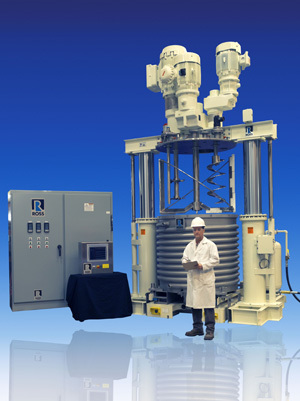 For more information, visit www.mixers.com or call 1-800-243-ROSS(7677).